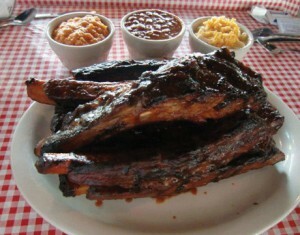 When a picture can say a thousand words… What does a Bison BBQ look like to you? Heat a cooker to 230° to 250°F. Remove the ribs from the refrigerator and outline them with a sharp, pointed paring knife. Combine all the ingredients for the rub in a small bowl and blend well. Season the ribs all over with the rub. Oil the grate and place the ribs on it bone side down over indirect heat. Cover and cook for 1 to 1 1/2 hours. Turn and cook for 45 minutes more, then turn and cook for another 45 minutes, or until pull-apart tender. Increase the heat to 350° to 400°F. Glaze the ribs with the sauce and cook for 5 to 7 minutes, being careful not to burn the ribs, then turn and glaze again and cook for another 5 to 7 minutes. Repeat 2 or 3 times, if desired. Transfer the ribs to a cutting board and let them rest, covered loosely with aluminum foil, for 10 to 15 minutes. Cut the ribs into individual pieces and serve with barbecue sauce.